The Sunshine Locality in the geographic center of the Great Basin has been the focus of scientific research since the mid-1960s. 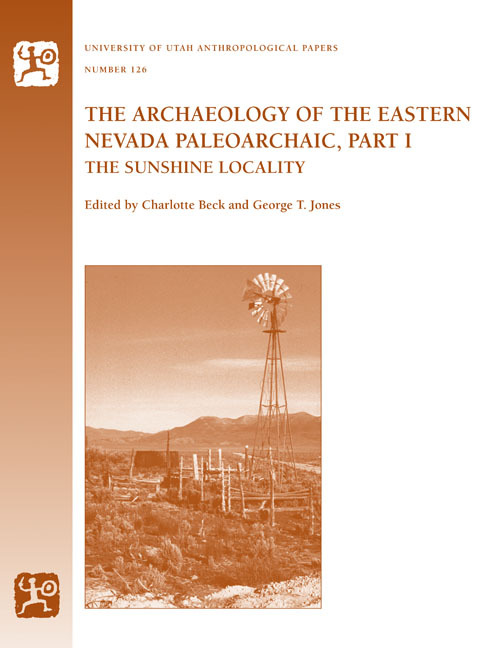 Authors Charlotte Beck and George T. Jones began studies there in 1992 and carried out excavations between 1993 and 1997 with the assistance of Hamilton College Field School. The area has yielded a rich and varied collection of diagnostic lithic tools, including fluted and unfluted lanceolate projectile points and a crescent, and a variety of gravers, scrapers, notches, and other tools common in Paleoindian toolkits across North America. This volume provides the first comprehensive treatment that combines historical research with the more recent studies. Analysis and interpretations of the stratigraphic sequence in Sunshine Wash are presented, including analyses of sedimentary textures and structure, depositional processes, and chronology. Faunal remains are used to evaluate local and regional environmental changes. Finally, the authors address the nature of the processes that created the archaeological record at Sunshine Locality, its age, and whether artifacts and remains of extinct mammals also recovered at the site are associated. This work begins to answer unresolved questions about the paleoenvironmental resources of the Sunshine Locality. Charlotte Beck is professor of anthropology at Hamilton College. Her work has been published in American Antiquity, Journal of World Prehistory, and Quaternary Research. She has edited two books, Dating in Surface and Exposed Contexts, and Models for the Millennium: Great Basin Anthropology Today (University of Utah Press 1999). George T. Jones is chair of the anthropology department at Hamilton College. He has coedited Quantifying Diversity in Archaeology, and was recently awarded the Samuel and Helen Lang Prize for excellence in teaching.